One of my favorite comics is Mouse Guard by David Petersen. Everything in the comics from art to story are done to perfection and it is a real treat to read the stories about the small mice and their adventures. Some months ago I learned that there also is a RPG based on the books. Since it seems to be impossible to get a hold of the rules in a physical copy I had to make do with the pdf. But that worked out ok as well. The rules in the game are very good and straight forward and quite quickly I felt that this might be something I could play with my children. I probably have to simplify the rules a bit for them, but playing as mice battling snakes and bats could make up some great stories for them. The biggest problem though is that the game is in English, so I have to translate it for them. 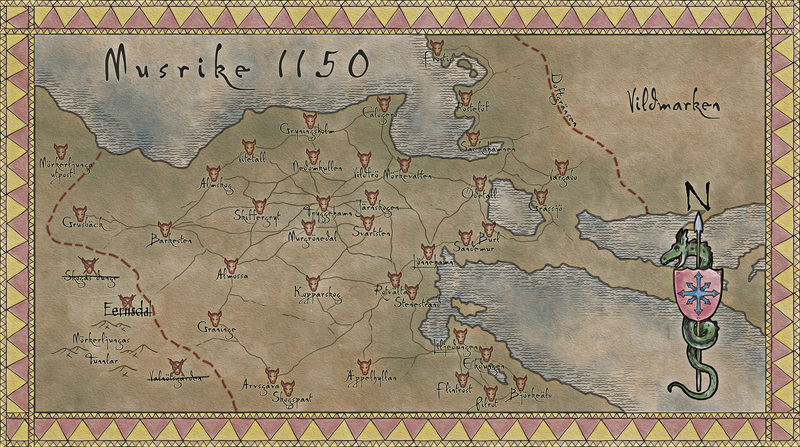 The first thing to do of course had to be to make a map of the Mouse Guard world in Swedish. The map in the post I entirely made in Photoshop and is based on the original map by David Petersen. It was great fun to make and translating all the names into Swedish was a bit of a challenge. Now I just have to convince my children that we have to play this, and of course I also have to finish simplifying the rules. Or I might just switch the rules to something that is already available in Swedish that we can use. 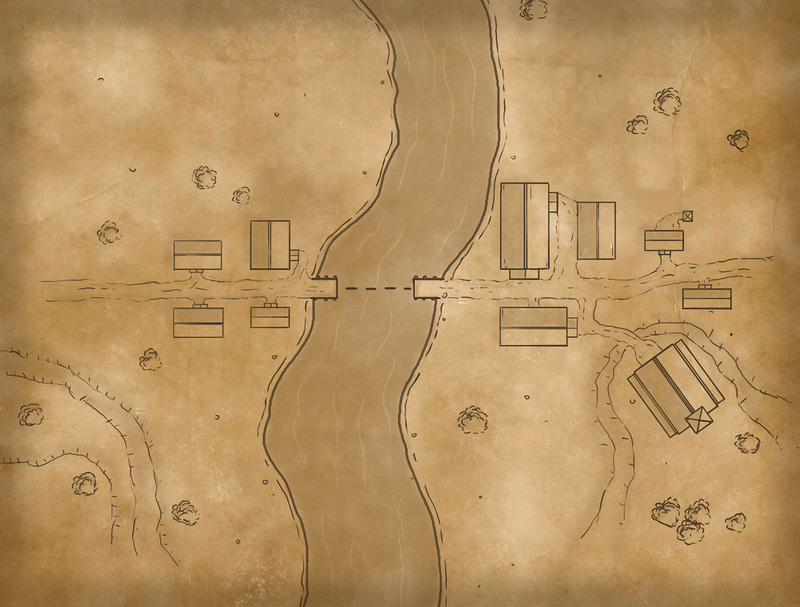 As you might know from reading my blog I’m drawing all my maps digitally, especially since I acquired my Wacom Cintiq. An important key while working digitally are brushes. Good brushes is usually the key to a great map. Well that is not completely true some talent for mapping is usually quite good to have as well. The default brushes that are included in Photoshop are good to work with to a certain degree. But after a while you start to notice that you wish that they behaved differently from what they do. Especially what I miss is how they respond to pressure. Or simply put they don’t respond in the same way as a real pen or pencil does. But the other day I found some great brushes over at the site http://frenden.com/. They have two interesting brush sets for Photoshop for sale. One is a set of brushes for inking and the other one is pencil brushes that are great for sketching. After downloading the two brush sets I tested them out and I must say that I am very please with how they behave. Especially the the pencil brushes are great and really give you the right feeling when it comes to pressure. I can really recommend them and at the top of this post you see a quick map I made with one of the pencil brushes. Nothing fancy really, but I can certainly see a great potential in the brushes, and I suspect I’ll be using them a lot in the future. The other day I bought the RPG The One Ring from cubicle 7, which I kind of fell in love with. Growing up with Tolkien on my bedside I was really thrilled finding this game that really nurtures the world of middle earth, really showing respect to the heritage. Well I’m not going to talk about the rules of the game, that I kind of like as well, but more about the maps. I think the maps in the game are absolutely fantastic. I like the simple lines that gives a very clear picture of the place it depicts, but at the same time leaves some parts to your imagination. One thing I’ve realized while making maps is that sometimes less is more when it comes to mapping. Leaving out details can actually in the end give you the feeling of more details in the map. This is a thin line to walk and it’s not always the right thing to do. 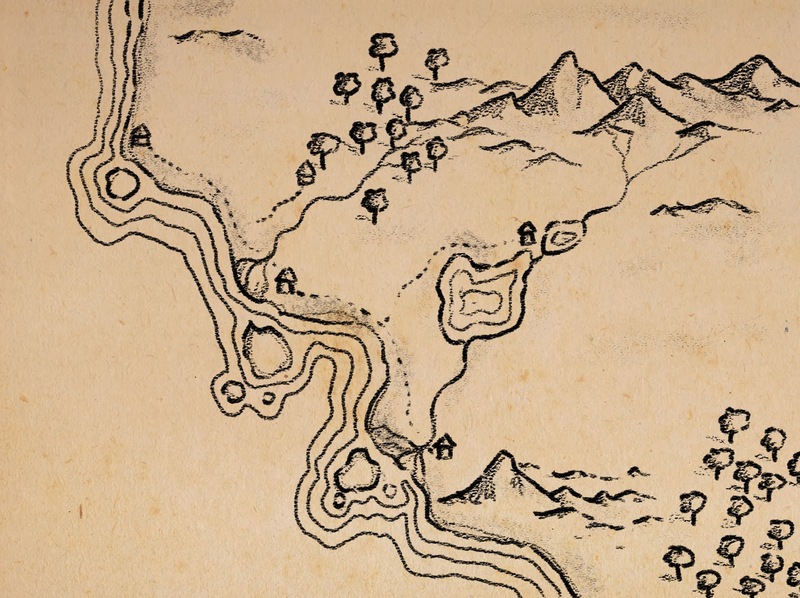 But for the setting in The One Ring I think that the maps are absolutely spot on. Inspired by the maps in the game I decided to try out something similar. This is a map of a small village divided by a ferry crossing. Nothing spectacular but a quick and simple training map. And I think I will continue down this path because something grand might come out of it in the end.